How to Maintain Fabric, Trim and Accessory Record in an Excel Sheet? Fabrics, trims and accessories are raw materials for a garment manufacturing business. In a garment factory the fabric and trim store is responsible maintaining inventory record. In this post I have shared one simple excel format for your reference. 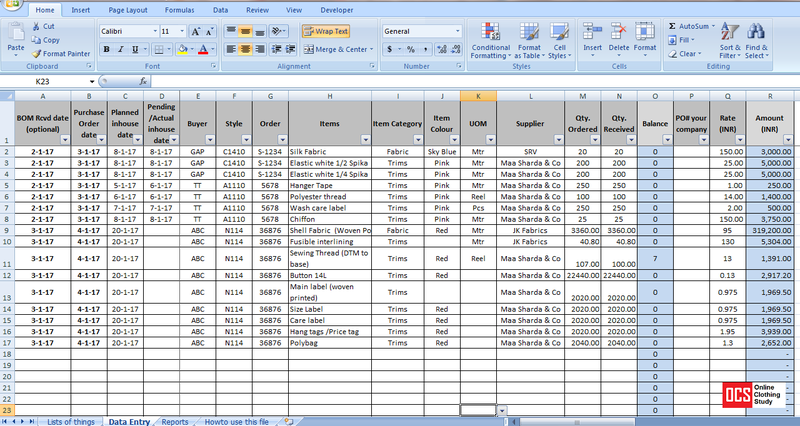 I have also explained how to make inventory tracking format in Excel sheet. You purchase different types fabrics, trims and accessories items for your orders and you also keep inventory for these items. You should keep stock of inventories of raw materials in your store to keep the production on without any break. High level of inventory cost to company and fewer inventories may slow down the production rate. To maintain right inventory level, you should know how much inventory you have in your store of all type of items and how much inventory you are expecting to receive in your store and expected date of receiving those items. As a store keeper, your main responsibility is to maintain minimum stock of all items (regular items) and controlling the inventory level by reordering. How to control your inventory without purchasing an inventory management and control software (ERP)? You need a tool to record all incoming materials, their volume and necessary information against each item. Spreadsheet like Excel sheet is one of the good options for them who don't have software for inventory management and control. Assuming that you still prefer excel sheet for inventory tracking. You can keep record of your inventories in a excel file and retrieve data whenever you need. For this you need to enter inventory record manually. In the excel template make columns for all necessary information that you need. Update your file regularly. I would suggest you to update your inventory tracking file daily. Use pivot table for viewing data against particular item. You can use various combinations for viewing data, like- inventory sourcing status of an order. 1. Prepare your excel file for data recording. When you will be preparing your excel format for factory inventory record, follow these points. Add columns in the format for as much information as you need. See the image below. I have added x number of columns. Use data validation for fields those will be entered repeatedly. Like buyer name, item type, UOM. By doing this you can avoid typing same thing differently. Benefit of using data validation in your template, easier to data sorting while you view reports. Use formula for calculations wherever applicable. Like balance quantity of items and item wise amount. Freeze pane as you need. In the sample template header row and 4 columns are freezed. Secure your excel sheet and inventory tracking file. To stop misuse of the inventory tracking sheet you can secure the file by password and also you can protect specific rows and columns if you want. You can set conditional formatting for highlighting certain cells, like low inventory level, pending purchase, and delay in sourcing. First decide what all information you want to maintain record. Based on that add columns in the format. If you prepare your format with unnecessary fields (columns) you have to fill all of them. Filling an excel sheet consume time. Like PO number, Style number, Buyer for the style, Item name, item type, item color, sourcing date, issue date, purchased quantity, issue quantity etc. See the following template for an example. Your inventory format is ready for recording fabrics, trims and other items. Don’t think much about the format that you made. Later you can add additional columns if necessary. Enter data in the excel sheet. Most of the departments are dependent on you for raw materials. Merchandisers, factory owners, sampling department and production people need to know the inventory status of a particular item. You are responsible for proving them right status of the inventory. You can provide right information to them at the right time, only if your inventory record is updated. So update your inventory tracking file daily. Don’t forget to cross check your data. Delegate data entry job one of your subordinates, if you are busy with other things. When you delegate work to someone remember to providing them instruction what to do and how to do. After few days of data entry you will have lot of data in the inventory tracking sheet. Finding particular information would be a tough job. You can see desired data (information) on the same sheet (table) by filtering data in desired columns. Pivot template is another option for doing data analysis and viewing report for the desired information. Prepare pivot table for common report types. You can also do post shipment inventory data analysis. Click on the following link to download the sample inventory tracking sheet. The sample inventory tracking sheet is just for your reference to prepare your own file. Note: There are some limitations of using excel sheet for inventory record. So if you can afford an ERP, better you go for one. Use secured database. There might be chance of making errors while entering data manually. Repeat entry of same information. Download this template and modify it as per your factory need. You you have any question you are welcome to write me. Online Clothing Study: How to Maintain Fabric, Trim and Accessory Record in an Excel Sheet? Learn the method of inventory control in a garment factory. Download sample Excel template and learn how to prepare your own excel template for maintaining fabric, trims and accessory record.